Parker Harrington Welles wanted for nothing. A successful children’s book author and daughter of a multi millionaire Wall Street businessman, she needs and loves nothing else apart from her son Nicky. That is until her father Harry Welles is indicted for insider trading and loses everything, including Parker’s and Nicky’s trust funds. She has been cleaned out and needs to start from zero. Her only consolation is an old house left by her great aunt in Gideon’s Cove. Her plan is to flip the house and sell, which is easier said than done seeing that the house is a big fixer-upper. Then James Cahill shows up to help restore the house while Nicky goes on a three week vacation with dad Ethan and stepmother Lucy (both Parker’s best friends). James is her father’s right hand man, his lackey, otherwise known to her as “Thing One” in the many years they have orbited in the same social circles. Parker loathes him, but since she needs help in fixing the house without the proper funds, she relents and lets him stay. Working in such close proximity breaks their walls and slowly, Parker realizes James is not the man she thought he was. James has always loved Parker though he never stood a chance with his boss’ daughter. Until one drunken night at a wedding when he finally had her…or so he thought. Years later, he is still nothing more to Parker than her father’s sycophant. But her change of fortune might just bring him the luck he needs to turn her heart around. I really enjoyed reading this book. Since I have been a Kristan Higgins reader for quite awhile now, her writing has become familiar to me in the sense that I felt like I was reading about a friend going through Parker’s life. Yet, the story is still as new and enjoyable as I expected it to be. James’ and Parker’s characters are easy to like and love. They have the same fears and apprehensions as we do about loving, leaving and hurting that make them so relatable, I couldn’t help but root for their relationship. My heart went out to James who has a bad past, a mistake he has had to live with since he was 12 years old, a guilt he has never let go. But he has been trying to make up for it by being a respectable person and earning good money to support the sister he loved and damaged the most. I felt so bad for James yet hopeful because even though he has been through so much, he’s not the one who’s emotionally unavailable. In fact he’s the one looking for somebody to love (ergo the title). Parker tends to run away when she gets emotionally attached brought about by her father’s betrayal during her childhood. Her lack of faith is understandable though I got a bit frustrated with Parker’s refusal to acknowledge her feelings for James only because I wanted them to get together already. In all though the pace of this book is just right. Apart from the Parker and James, the other characters to watch out for are Lucy, the supportive best friend, and perfect paragon Ethan. Their own love story is from Higgins’ earlier book THE NEXT BEST THING. Other people to fall in love with are Lavinia (the chain smoking cousin and florist), Mary Elizabeth (Parker’s biggest fan) and Chantal (best cougar in town). Be ready for thrills, sweet love and good banter. The epilogue alone deserves to be read many times over. All I can say is get ready to fall in love. I'm a big fan of Kristan Higgins. Can't wait to read her newest! Hi! May I know where did you get a copy of this book?? I was trying to buy from amazon.com but they said the title is not available in the philippines. 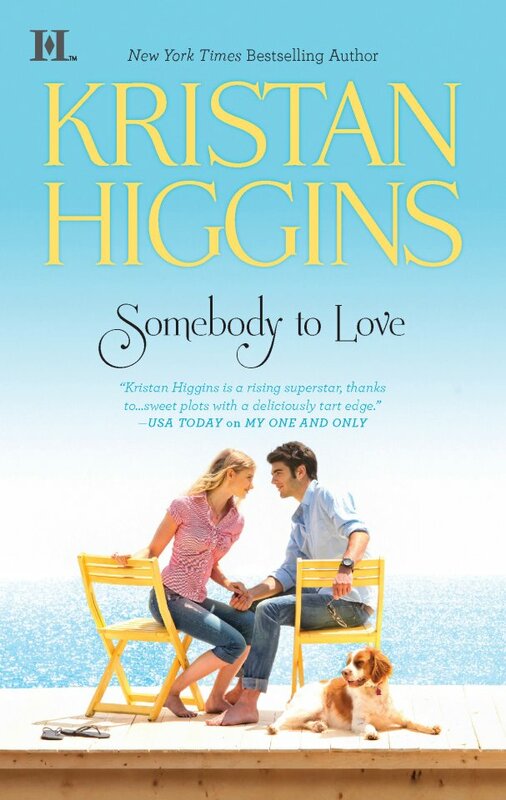 I recently read and reviewed Somebody to Love too. :) While I do enjoy reading Kristan Higgins' novels because they're light and fun, I haven't found one to love yet. Have you tried reading Julie James? She's my favorite contemporary romance author. Anyway, just wanted to comment because it's nice to see a fellow Filipino reading the same books that I do.